When our friends got engaged a few years ago we received their Save-the-Date card in the mail. Generally when people send out stuff like this there is a lot of other stuff you need to hang on to and your lucky if you can remember where you put it. When we opened the envelope what we got instead of a lot of paper was a magnet with all the details right on it. It was so convenient. We just put it right on our fridge where we were easily reminded of the event. 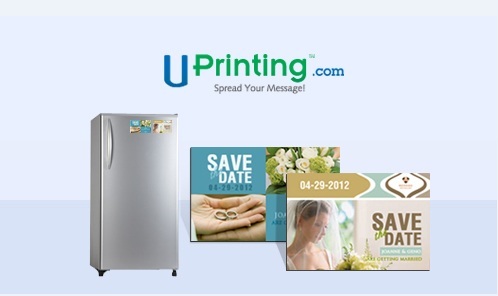 If you have a special event that is coming up then you will want magnet printing as your Save-the-Dates’ from UPrinting. With durable 17pt magnetic stock available in standard and custom size with a high gloss finish, your magnet cards will look amazing. 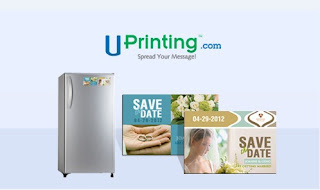 I know you are super excited about getting your own cards so thanks to UPrinting we are giving away 25pcs business card magnets for one winner. 2” x 3.5” 13pt Magnet Gloss, Front Only Printing.